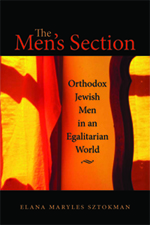 The book, “The Men’s Section” (published by the Hadassah Brandeis Institute, UPNE) is about the identities of Orthodox Jewish men, based on interviews I conducted with 54 men who belong to “partnership synagogues” or “ortho-egal” synagogues in Israel, North America and Australia. These are synagogues, like Shira Chadasha in Jerusalem, that try to maximize women’s participation in the prayer service within bounds of halakha. Women can read Torah, lead certain parts of the service, give speeches, and sit on committees, but they do not count in a quorum (minyan), nor do they lead any part of the service that requires a quorum. But of course, I wasn’t interested in the women. I was interested in the men. Why? Why men? Why men in partnership synagogues? In other words, what he was saying was that these roles that women are taking are very important to his sense of what it means to be a man – a religious man. I found this so intriguing, and I wanted to know more. (Note that he didn’t mention halakha; it was not a halakhic issue for him.) I had two questions that interested me. First of all, I wanted to understand how shul practices like layning (reading Torah) create Orthodox masculinity. Meaning, he was basically saying that without that function he would be at a loss to define what it means to be a man – but I wanted to know what else is there. When people in the Orthodox community says, “Be a man” (think about EVERY bar mitzvah you’ve ever been to), what do they mean? I mean, what do they REALLY mean? There is a famous article by Paul Kivel called the “’Act like a man’ box”, in which he claims that American men are socialized into certain behaviors that are considered “masculine” – be aggressive, tough, competitive, emotionless, strong, etc – that keep men in a proverbial box. So I wanted to know, what does the “’Be an ORTHODOX man’ box” look like? So that question became the first part of my book. It offers a profile of the “Be an Orthodox man box” – it’s a compilation of behaviors and personality traits that together create a kind of “ideal” Orthodox man. The second question I had was this: If reading Torah and being “the man” in shul is so important for Orthodox men’s sense of identity, then how is it that men of partnership synagogues are able to deal with it? How can they kind of “move aside” as it were, make space for women, abdicate power and control – and still be fully comfortable in their masculinities? How do they do that? What navigations within themselves did they have to do in order to make this okay? So that’s the second part of the book -- it’s all about men’s navigations and negotiations around identity, gender and religion. So that’s why I interviewed this population of men. I wanted both perspectives – I wanted to know how they viewed Orthodox life, and how they were able to manipulate these male gender issues that they were socialized into in order to participate in the partnership synagogues. It’s like talking to people on the edge, on the margins of a particular culture. They have a perspective that allows them to see everything that’s going on inside while reflecting on it from almost outside. These men are like that – on the margins, or on the cusp, straddling cultures, between in and out, between past and future, between men and women. Their perspectives are fascinating. Certainly this has implications for Judaism and Orthodoxy, as well as gender and masculinity. But not only. This is also about identity and culture in general. I’m interested in how people interact with the cultures that surround them, and how we negotiate with our surroundings to form our own “I”. The theory behind it is that our identities are in constant tension between demands of culture/society and our individual process of resistance. Meaning, we get messages all the time from different aspects of our culture (family, schools, tradition, media, advertising, peers, workplaces, etc), messages that tell us how we should be, what it means to be “normal”, what it means to be a “good” or “correct” man or woman or adult or parent or daughter or Jew or whatever. We get these messages, and some of them we conform to and internalize, while others we reject and resist. Most of us have lots of narratives in our head that say things like, “Well, I was brought up to do and believe X, but I have chosen Y.” That tension, between what the culture tells us and what we choose for ourselves, is the process that creates our sense of self. It’s the stuff of identity. My feeling is that women have been better trained in how to have this conversation within themselves than men. Thanks to the feminist movement, most women today are able to easily say, “I was brought up to believe that to Be a Woman means to be X, but for me, I have decided that To Be a Woman means Y (or part of X, or X and Y).” Women, for the most part, have a language to describe their navigations of gender identity. We understand, usually, that society is trying to mold us. We pick and choose from these messages, as best as we can. But men? Men, for the most part, do not have a language AT ALL to describe how they were socialized into masculinity. Out of all my interviewees, only 3 or 4 were able to engage in the conversation on that level, to be able to say, “I was brought up to believe that to Be a Man means X, but I believe that to Be a Man means Y.” How many men do you know who talk about their identities that way? What will this book accomplish? That’s what I want this book to accomplish: Conversation. Lots and lots of conversation. I want the Orthodox community in particular to begin to ask itself how masculinities – the whole “Be a Man Box” – factors into discussions about religion and politics. I want to just give the community a new lens, a new framework with which to ask ourselves the question, how are we doing? How are we doing as a group, as a society, as a religious/spiritual community? Ultimately, my goal is to help create a more compassionate community. I want people to be able to reflect on themselves and on the society around them and ask how can we promote a Jewish identity that truly reflects the Divine image in all of us? How can we transmit messages about what it means to be a Man or Woman or Adult or Child or Jew or anything else that are compassionate and caring, with room for everyone to be part of the community? That is the conversation I want to start. That is what I hope my book will accomplish. And as you can see, I’m just so EAGER to talk about this, so excited to be embarking on this journey. And I would be delighted to engage in this conversation anywhere at any time. If you want to discuss this further, send me an email – or even better, contact me on Facebook, so others can join in the conversation. I am just so happy to start talking about this. Amazon, of course! Click here. Kindle and Nook copies will be available soon. You can also order directly from the publisher, where you can also read some reviews.